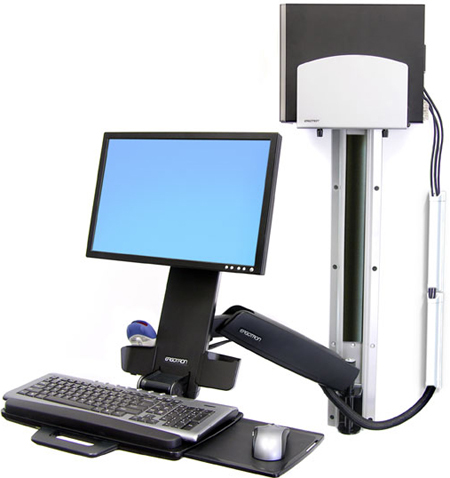 This complete system provides easy re-positioning of your entire workstation - move your display, keyboard, mouse and barcode scanner in a single motion. 1. Flexible, open-architecture design is scalable for future computer equipment. 2. 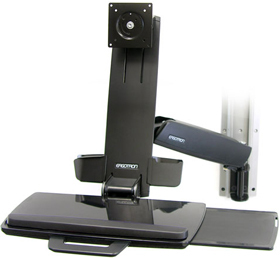 Comfortable, ergonomic data entry - work sitting or standing with 20" (51 cm) lift adjustment. 3. Maintains the relative position of screen and keyboard throughout full range of motion. 4. Five-inch (12.7 cm) independent LCD height adjustment ergonomically accommodates average range of users. 5. Easy to clean design promotes infection control. 6. 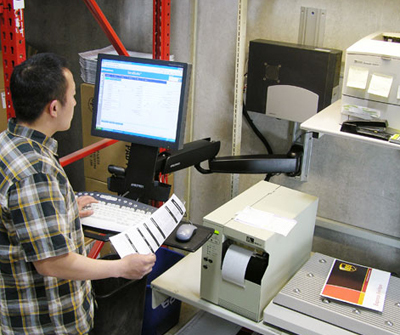 Barcode scanner holder provides easy access to hand-held scanner. 7. 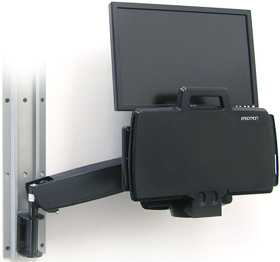 Extend LCD and keyboard up to 39" (99 cm) from wall; fold equipment back out of the way when not in use. With keyboard in storage position, system depth is as little as 12" (30.5 cm). 8. Ergonomic negative-tilt keyboard tray (with left or right mouse tray) ensures wrists remain in a neutral position during data entry. 9. Clean, concealed and neat routing of cables through the expansive cable management system.